The advantage of seeding was illustrated by Irish fortunes in yesterday's Europa League draw with Dundalk handed a winnable tie - but unseeded duo Shamrock Rovers and Derry City face tough tests. Remarkably, Dundalk have been dealt exactly the same hand that their rivals Cork received last year. They will start off against Levadia Tallinn of Estonia and if they succeed in getting through that tie (Cork beat Levadia 6-2 12 months ago) then they will face Cypriot side Larnaca who were too strong for the Leesiders. Both Levadia and Larnaca were towards the top of the rankings for unseeded teams in both rounds so the draw certainly could have been kinder to the Louth men. 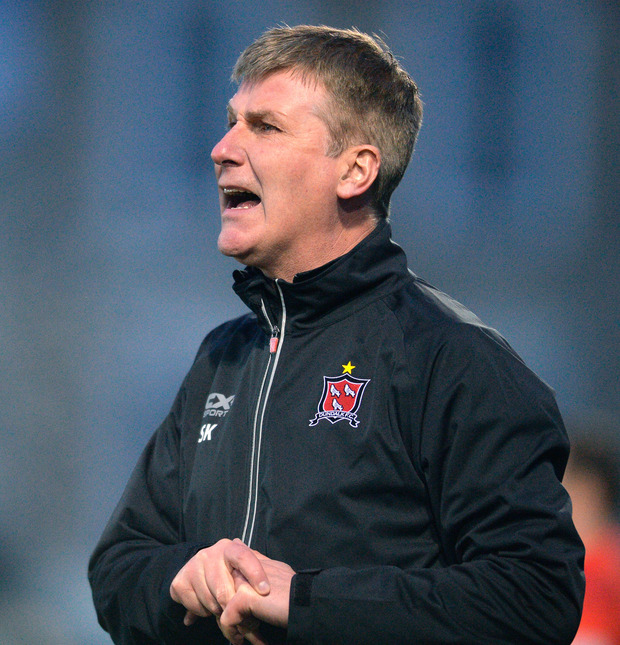 Manager Stephen Kenny has warned against underestimating Levadia and described Cork's result against them as "irrelevant" because their squad has changed in the intervening period. He has respect for Estonian football drawn from negative past experience. It was a loss at the hands of Levadia in 2004 that ultimately led to the end of his stay as Bohemians boss. All three Europa League representatives receive €240,000 for participating and will collect a further €260,000 if they can book their passage to the next round. Shamrock Rovers got past Icelandic opposition at the first hurdle last year and they face a much stiffer Scandinavian test in the form of Swedish side AIK. They were runners-up in the Allsvenskan last year - seven points behind champions Malmo - and currently sit second in the table. AIK have agreed a deal to bring Sebastian Larsson back home once the World Cup draws to a close and it's possible he could make his debut against the Hoops. Rovers play at home first and will have their work cut out to travel to Stockholm with hopes of playing Danish side Nordsjaelland or Northern Ireland's Cliftonville in the next round. A strong home showing will also be the mission for Derry City who welcome Dinamo Minsk to the Brandywell before travelling to Belarus seven days later. Clashes between clubs from Ireland and Belarus have been frequent in recent years. Dundalk played BATE Borisov in successive years, and Minsk are the second strongest team in their native country. They went close to claiming the title last year and lost out on goal difference but BATE are six points clear of them in this year's title race. If Derry get through, they face Dunajská Streda of Slovakia or Dinamo Tbilisi of Georgia.